This entry was posted in "Thanks A Million", Bliss!, Generosities, Hotter Than That, Irreplaceable, It's All True, Jazz Titans, Pay Attention!, Swing You Cats!, That Was Fun!, The Heroes Among Us, The Real Thing, The Things We Love, Wow! and tagged Alex Hall, authenticity, Beau Sample, Bryan Wright, Carl Sonny Leyland, hot jazz, Ink Spots, Jazz Lives, Kim Cusack, Michael Steinman, Rivermont Records, STOMPIN' UPSTAIRS. Bookmark the permalink. All I had to do was see the names on the post, and I knew this had to be a great CD. I checked out the samples,,,You’re right, and so am I..It is a great CD! 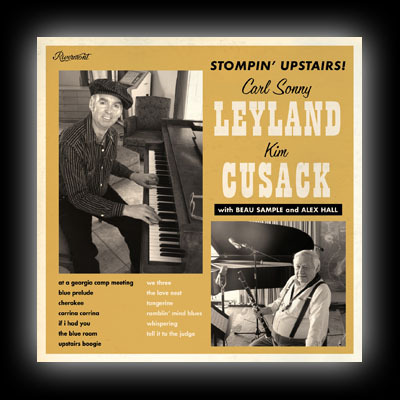 I have been a big fan of Carl Sonny Leyland, and Kim Cusack since the first time I heard them. They are such great musicians. Thank you NM. In the words of the song, WE KNOW THAT YOU KNOW! So your approval means a great deal . . .